Despite Davidson College’s vigorous academic requirements, students have always found the time to engage in a wide variety of activities through clubs. From the 1870s to 1940, students created and participated in arts and communications clubs that allowed them to focus on their passions beyond academics and sports. The first non-sports related clubs were primarily music clubs. As time passed, Davidson students expanded their repertoire to include theatrical organizations, some fine arts groups, debate teams, and student literary societies. Music has grown in popularity throughout the campus over time. Different musical entertainment groups have helped to shape Davidson College as a whole. Starting with small informal clubs, such as a jug band, and ensembles and quickly progressing to nationally renowned instrumental groups, music as an extracurricular activity has played a key role in the student social life. Since the founding of the college in 1837, student-run music groups have been formed both formally and informally. Starting in the 1860s, musicians gained status at the college with the creation of the first music organization, the Glee Club, in 1868 (Beaty 83). This vocal group was an early step in the founding of the music department, as students who participated petitioned the faculty to allow them to take music lessons outside of the college. The Glee Club was soon joined by Guitar and Mandolin Clubs. Individual instrumental musicians stood out in those early years as well, due to the small student population. Everett L. Bishop, class of 1912, wrote, “the music of that time was not of marked volume, it was of excellent quality” in a letter to a Miss Cornelia Shaw. 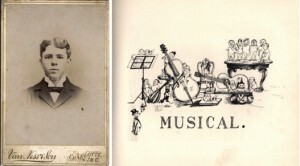 As instrumentalists watched the rise of popularity with the Glee Club, many were encouraged to pursue musical interests. This shared interest came together in forming the original orchestra. According to that same letter written by Everett L. Bishop to Miss Cornelia Shaw, the original orchestra was of high quality and consisted primarily of violins and flutes, though the limited number of musicians made it more of a chamber music assembly rather than an actual orchestra. As seen in rosters recorded throughout several decades of Quips and Cranks, the orchestra grew from about a dozen students to upwards of sixty in the years following its creation. Both the Glee Club and the Orchestra often performed together in and around the community, and their sizes continued to increase over the years; as did their popularity and impact on campus. 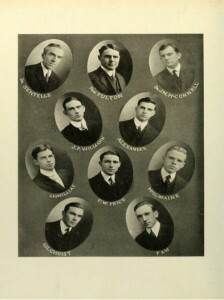 A small college band consisting of ten members playing brass instruments and one drum appears in the club section of the 1912 yearbook. Although it lasted only one year, it presaged interest in bands as well as orchestras. 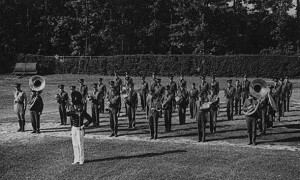 According to Grier M. Williams, the rise of musical interest enabled the addition of an ROTC band. The Reserve Officers Training Program (ROTC) became a part of the Davidson curriculum in February 1919. The band formed by the battalions became the only official wind instrument group on campus. 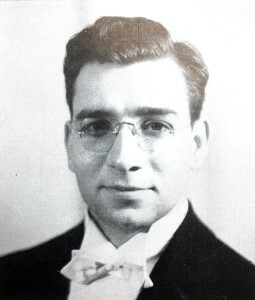 That changed with the installation of the College Concert Band in 1933, directed by James Christian Pfohl, who was responsible for much of the development to the music department during his time as music director at the college. Strong interest in music over the years has helped to sustain several different music organizations on campus throughout the decades. Whether sponsored by the music department or as purely student-run initiatives, music groups consistently hold a strong place in the extracurricular lives of students. Theatrical life at Davidson College changed considerably throughout the late 19th and early 20th centuries. For the majority of this time period, students were not permitted to have any theatrical clubs or performances on campus. 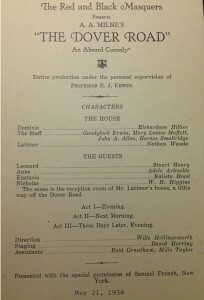 In 1895, however, seniors were able to persuade faculty to allow twelve members of their class to perform a play, Sheridan’s Rivals, at commencement. 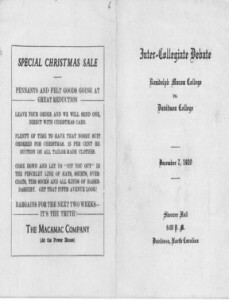 Students raved of the play, claiming in an article in the 1895 Davidson Monthly that it had “eclipsed any previous histrionic achievement” (Davidson Monthly). The faculty, however, was not convinced. In a faculty meeting three years later, they officially banned all theatricals, claiming that “for a College under direct control of the church, amateur theatricals are hardly advisable as a form of entertainment” (Faculty Minutes 29 March 1898). Over the next 20 years, students could neither perform public performances on campus nor organize any dramatics clubs. 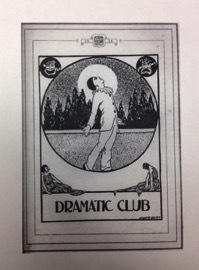 Finally in the fall of 1920, Professor Edward Jones Erwin, a first year professor at Davidson, organized the “The Dramatics Club” (Quips and Cranks 1923). The Club’s first showing was the Wildcat Minstrel at Senior Speaking, as documented in an article in the 1923 Quips and Cranks. This technically was considered a class related production, not club related, but it fed into student desire to establish a theatre class. Within the next two years, the Dramatics Club presented various plays at other Junior and Senior Speakings, such as Sultan of Sarawak, The Zone Police, Miss Civilizations, and The Monkey’s Paw (Theatre Timeline). The Dramatics Club began to call themselves the Red and Black Masquers around 1926 and each year held two major productions which were open to anyone who wanted to try out (Quips and Cranks 1949). This organization sponsored theatrics at the College for the next few decades, eventually leading to the establishment of the Theatre Department in 1963. We know about visual arts clubs at Davidson College not because of their presence, but rather their lack thereof. Visual arts and music were not even included in the college curriculum for most of the 19th century, as they were not part of the traditional liberal arts emphasis on Greek, Latin, Math, Chemistry, and what was called “moral philosophy” and “natural philosophy” (later to be termed physics) (Beaty 20). Visual arts was not considered to be a field of substance, so Davidson students did not study it in their curriculum or their leisure. 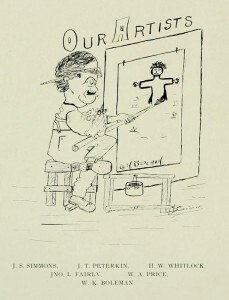 While students did not have any clubs specific to visual arts, in an issue of 1895 Quips and Cranks, one of the cartoons is drawn by a student. This student, Edward Smallwood Vass, was credited on file for a sketch for a musical club. Students could submit cartoons or other drawings to be featured in Quips and Cranks, thus providing an outlet for visual art expression. College cartoonist poking fun at themselves. New opportunities for cartoonists opened after the founding of the student newspaper, The Davidsonian and student humor magazines. The first issue of the Davidsonian appeared on April 1, 1914. The first cartoon came a few years later on December 6, 1916. 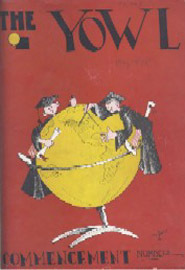 The first issue of the student magazine Chameleon was published in May 1926. It morphed into the Yowl in 1930 and again into Scripts and Pranks in 1936. Student artwork graced the covers as well as providing some of the humor. 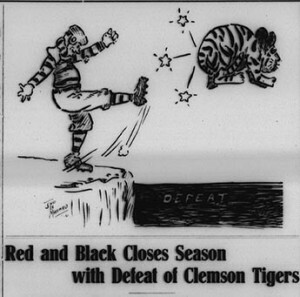 First Davidsonian cartoon -published before the college teams became the wildcats. Starting in the early 1900s, several clubs focused on photography. Davidson students were quick to adopt the newly invented Brownie camera. 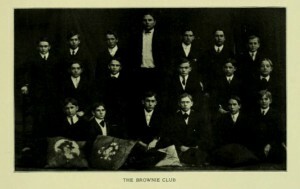 First sold in 1900, a Brownie Club was featured in the 1905 and 1908 editions of Quips and Cranks. 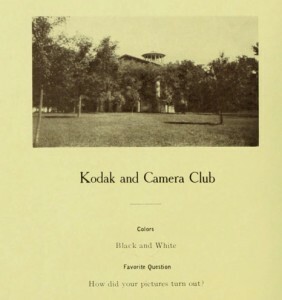 In 1909,the group renamed themselves the Kodak and Camera Club and continued to appear in the club section of the yearbook through 1915.These early photographers may have been serious about their work but did have a little fun picking their club colors: Black and White. The college seemed to accept the idea of visual arts slowly, for only these clubs exist. Shortly after this time, professors also begin to argue that students should have knowledge pertaining to artistic skills. Beaty mentions one professor who argued to the Board of Trustees in 1934 that “’the great Educational Associations of America are stressing the importance of Music and Fine Arts in colleges’”, and that Davidson students should have a true liberal arts education (Beaty 304). Davidson College had students skilled not only in the arts, but also in debate, oration and composition. This lead to the formation of communications clubs. One of the earliest of these clubs was the Debate Club. Debate was extremely popular on college campuses from the early 19th century all the way up to the 1940s because America saw debate and oration as a skill of an educated man, a concept reflecting classical ideas of education (Howe). Though the precise date of the creation of the debate club is unknown, debates originally occurred primarily between the two literary societies on campus, the Eumenean and Philanthropic societies. These were the first student-run organizations at Davidson, created in 1837. The organizations focused on personal improvement via debate (Sanchez). Some of their debates were over questions like “ought students to associate with ladies while pursuing their studies?” “Ought the Indians to be driven from the land they occupy?” and, “Can there be a greater knowledge of the country obtained by traveling or by the study of geography?” (Sanchez). These questions demonstrate how Davidson students were interested in addressing personal and local questions, as well as political questions. 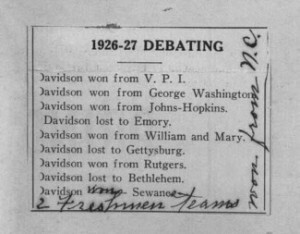 After the formation of the Intercollegiate State Oratorical Association in 1890, formal debate clubs came into the limelight, and Davidson’s students could compete with students from other schools (Debate Club Collection Description). Headlines, like the one published in the Davidsonian on April 17th,1924, “Davidson Debaters Down Emory Stars at Queens” were common after 1914 (1924 Davidsonian). Student pride for their debate teams was obvious in the way the Davidsonian front page was filled with triumphant reports of the oratorical successes. The largest composition club on campus was the Blue Pencil Club, a club that used written work as a form of personal entertainment and improvement like the Eumenean and Philanthropic societies. Founded in 1914, it became a chapter of Sigma Upsilon literary honor society in 1915 and existed until 1966. (Sigma Upsilon minutes 18 Jan. 1915, Sigma Upsilon Finding Aid). According to their constitution, the Blue Pencil Club’s goal was “to promote more effective literary work among the students” (Sigma Upsilon minutes 1915). They certainly took admission seriously, as one had to be both an upperclassman and nominated in order to obtain membership and after February 10th, 1915, each member was required to provide the club with two papers that would then be placed in the society’s records. The Blue Pencil Club did have professors as members, but even they were required to be voted into the club (Sigma Upsilon minutes 18January 18 1915). With these standards, it is no surprise that admission was impossible for women in the Davidson community. The club’s minutes on February 16th, 1916 note that the Sigma Upsilon National council requested the club vote on admitting women, but the “action to admit women into the club was unanimously voted down” on March 8th (Sigma Upsilon minutes 1916 ). Even if the club had decided to admit educated women into the Davidson chapter, few would have been eligible. Despite the high-minded sounding nature of the club, the members left proof of their more humorous natures in their official documents and written works. In the March 19th, 1923 meeting minutes, W.J. Cooper, the secretary, noted under business, “the main business of the night was the wafting of certain fortunate across the turbid styx” (Sigma Upsilon minutes 1923 ). Though individual short stories, poems, and plays were a large part of the club, often they would create continuous stories in which each person would write a chapter of the story and then pass it along to the next author (Sigma Upsilon Finding Aid). One of these continuous stories, written between 1937 and 1939 by both professors and students, was titled Caldwell Pharr Johnston. * An article in the Davidsonian on March 7th, 1940 reports how Professor C.G. 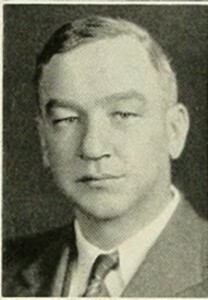 Davidson, a history professor and library director, wrote the first and last chapters of the novel (1940 Davidsonian). Despite professors being involved, the story goes haywire quickly with the main character, nicknamed Card, starting out at Davidson, getting an inheritance, flying to Japan, and ending with the conclusion of a murder investigation, and throughout all of this are lurid tales of the Card’s sexual escapades with various women (Caldwell Pharr Johnston). The story, though thoroughly inappropriate, demonstrates a more relaxed and comical atmosphere than was conveyed by the club’s official constitution. It also demonstrates how the club allowed professors and students to come together in a more informal way. Eventually the society faded, but many of their compositions are still held in the Davidson College archives. From the late 1800s to the early 1900s, there was a large growth in the club scene at Davidson. Clubs as extracurricular activities gained attention at this time, as the college underwent changes from the original “Classical Education” mindset to the later prevalent focus in the Liberal Arts. As attention was paid to such clubs in the fine arts and other focuses, the development of school funded departments came along as well. With student interest came action both on the parts of the students as far as clubs went, and the faculty in creating such programs as to accommodate the interests of the student body. This developmental period of the college proved to be a time where students, as they continue to do so decades later, pursued interests in a broad variety of focuses when it came to academics as well as extracurriculars. * There was a Davidson student named Caldwell Pharr Johnston in the class of 1925. He is the grandfather of one of the authors, Bess McLawhorn. Beaty, Mary D. A History of Davidson College. Davidson, NC: Briarpatch, 1988. Print. Bishop, Everett L. Letter to Cornelia Shaw. 1912. Music – History – Bands – Davidsoniana file. Davidson College Archives, Davidson, NC. Caldwell Pharr Johnston. 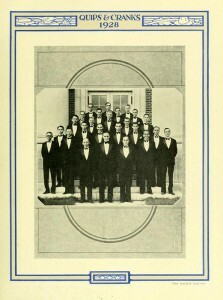 Davidson: Sigma Upsilon Literary Fraternity, 1937-1939. Print. Sloop, Alice. “Chalmers Gaston Davidson.” Davidson Encyclopedia. 2009. Web. Also available at: <http://libraries.davidson.edu/archives/encyclopedia/chalmers-davidson>. Clipping from unknown newspaper. Davidsoniana Files. RG 6/14.53. Davidson College Archives, Davidson College, NC. “Davidson College Archives Collection Debate Club Collection Description” Finding aid of Davidson College Archives. Davidson College Archives, Davidson College, NC. “Davidson College Archives Collection Sigma Upsilon Collection Description” Finding aid of Davidson College Archives. Davidson College Archives, Davidson College, NC. Davidson College. Quips and Cranks. Davidson: Davidson College, 1895-1940. “Davidson Debaters Down Emory Stars at Queens.” The Davidsonian. 17 April 124:1. 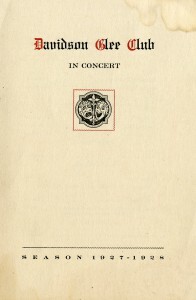 Available at: <http://library.davidson.edu/archives/davidsonian/PDFs/19240417.pdf>. Davidson Monthly, June 1895, p. 385. Theatre Davidsoniana file. Davidson College Archives, Davidson, NC. Drama at Davidson- History Through 1999- Theatre Davidsoniana file. Davidson College Archives, Davidson, NC. 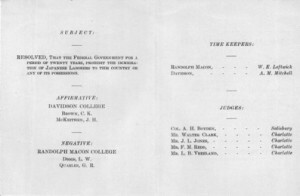 Faculty Minutes, 29 March 1898. Drama at Davidson History through 1999- Davidsoniana file. Davidson College Archives, Davidson, NC. 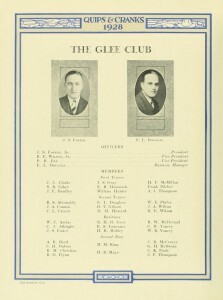 Glee Club Program. 1928. Glee Club. Davidson College Archives, Davidson College, NC. Howe, Daniel. “Classical Education in America.” The Wilson Quarterly. 2011. Web. Also available at: <http://archive.wilsonquarterly.com/essays/classical-education-in-america>. 1909-1926 Davidsoniana Files. Davidson College Archives, Davidson College, NC. Photograph of first Sigma Upsilon Chapter at Davidson College. Quips and Cranks 1915. Davidson: Davidson College, 1915. Photograph of Glee Group. Quips and Cranks 1928. Davidson: Davidson College, 1928. Photograph of Glee Group Roster. Quips and Cranks 1928. Davidson: Davidson College, 1928. Photograph of James Christian Pfohl. Quips and Cranks 1936. Davidson: Davidson College, 1936. Photograph of The Concert Band. Davidsoniana Files. RG 17/03.33. 1937. Band Pictures Davidsoniana File. Davidson College Archives, Davidson, NC. Photograph of ROTC Band. Davidsoniana Files. RG 17/04.37. n.d. Band Pictures Davidsoniana File. Davidson College Archives, Davidson, NC. Davidsoniana file. Davidson College Archives, Davidson, NC. Sanchez, James. “Eumenean and Philanthropic Literary Societies.” Davidson Encyclopedia. December, 2003. Also available at:<http://libraries.davidson.edu/archives/encyclopedia/literary-societies/>. Sigma Upsilon Finding Aid. Sigma Upsilon Davidsoniana File. Davidson College Archives, Davidson, NC. Sigma Upsilon Literary Fraternity. Meeting Minutes. 18 January, 1915. RG 6/14.20. Sigma Upsilon Fraternity Records. Davidson College Archives, Davidson College, NC. Sigma Upsilon Literary Fraternity. Meeting Minutes. 10 February, 1915. RG 6/14.20. Sigma Upsilon Fraternity Records. Davidson College Archives, Davidson College, NC. Sigma Upsilon Literary Fraternity. Meeting Minutes. 16 February, 1916. RG 6/14.20. Sigma Upsilon Fraternity Records. Davidson College Archives, Davidson College, NC. Sigma Upsilon Literary Fraternity. Meeting Minutes. 19 March, 1923. RG 6/14.20. Sigma Upsilon Fraternity Records. Davidson College Archives, Davidson College, NC. Sigma Upsilon Fraternity. Short Stories Davidsoniana Series. 1922. RG 6/14.20. Sigma Upsilon Davidsoniana file. Davidson College Archives, Davidson, NC. “Sigma Upsilon Hears Essays.” The Davidsonian. 6 October 1940:1. 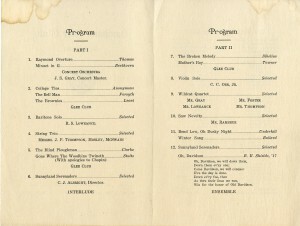 Student Organizations, Red and Black Masquers, 1949-1954- Theatre Davidsoniana file. Davidson College Archives, Davidson, NC. Theatre Timeline, c. (1838-2012), Theatre History- Theatre Davidsoniana file. Davidson College Archives, Davidson, NC. Williams, Grier M. “A Brief History of the Davidson College Concert Band.” Unpublished Essay. Music – History – Bands – Davidsoniana file. Davidson College Archives, Davidson, NC.